As an example of changes and signs of planetary activity within a stars disk, Beta Pictoris is a young star that shows signs of such planet formation. 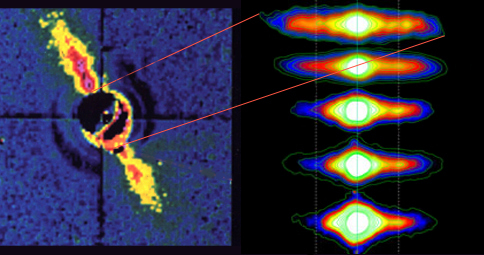 The observations on the right, taken in the mid-infrared, reveal a higher concentration of fine particles of dust, rock and ice in one region of the disk. The debris has given the disk around the star a lopsided appearance. This suggests a collision between large bodies of rock and ice. This particular crash is thought to be of equivalent size to the incident that many believe occurred to this Earth and created the moon. Given the amount of material within the dusk and the fact that Beta Pictoris is a young star, and in relation to the alternative concept of this website, I think the collision may also be the birth of a Roaster, an early bloated gas giant, which will begin to carve away and refine the disk, thus starting to clear that system's ecosphere.